This early photograph of the ancient monument was made by Major-General Sir Henry James, who was then Director General of the Ordnance Survey. The survey had been established at the end of the 18th century to produce the famous one-inch-to-the-mile maps. James was an enthusiast for the new science of photography and was among the first to realise how it could be used to enlarge or reduce maps. 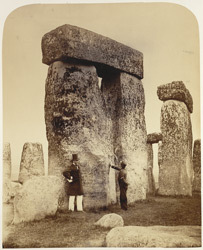 The photograph of Stonehenge was processed in the experimental studio he built at Southampton. There his staff invented a technique for transferring photographs to printing plates, for which James claimed most of the credit and christened ‘photozincography’.